Diaptomus sp., from the United States Great Lakes Environmental Research Laboratory. The Diaptomidae are a group of pelagic freshwater copepods. Characters (from J. M. Bradford-Grieve): Female with rostrum without filaments; rostral margin extends into 2 points. Cephalosome and pedigerous somite 1 separate; pedigerous somites 4 and 5 separate. Posterior corners of prosome in lateral view with 1 acute point, or divided into 2 protrusions; dorsal view symmetrical. Urosome with 2 free somites, or with 3 free somites. Genital double-somite symmetrical in dorsal view; gonopores close together and partially covered by single cuticular flap; without seminal receptacles. Caudal rami symmetrical. Antenna 1 with 25 free segments. Antenna 2 exopod with 7 free segments; 12 setae; basis and endopod separate. Mandible basis with 3 setae; endopod terminal segment with 8 setae. Maxilla 1 basal exite seta present; exopod extends short of endopod distal border. Maxilla 2 coxal epipodite seta absent. Maxilliped coxal endite 2 with 2 setae. Leg 1 basis inner distal seta absent; outer seta absent; endopod with 2 segments; exopod with 3 segments; exopod segment 1 with outer distal spine; exopod segment 3 with 4 inner setae. Leg 2 endopod with 3 segments; exopod with 3 segments; exopod segment 3 with 1 outer spine. Leg 3 basis outer distal spine absent. Legs 3 and 4 endopod with 3 segments; exopod with 3 segments; exopod segment 3 with 1 outer spine; exopod segment 3 with 5 inner setae. Leg 4 endopod segment 3 with 7 setae. Legs 2-4 surfaces naked; terminal spine with outer border serrated. Leg 5 present; very dissimilar from legs 2-4; coxa inner border without seta; biramous but not natatory, may be slightly asymmetrical; coxae and intercoxal sclerite fused with outer distal tooth; basis with outer border seta; endopods 1-segmented, rod shaped; exopods 3-segmented, segment 1 cylindrical and unornamented, segment 2 tooth-like with inner border denticles and outer spinule, terminal segment very small and inserted subterminally bearing about 2 spinules. Male with pedigerous somites 4 and 5 fused or partly fused, or separate. Posterior corners of prosome in dorsal view symmetrical, or asymmetrical. Mouthparts well-developed. Antenna 1 geniculate on right. Maxilliped endopod segments 5 and 6 with outer setae normal. Right leg 5 biramous; endopod separate from basis and 1-segmented, or 2-segmented; exopod elongate, 3-segmented, segment 1 with outer distal spine, segment 2 with long spine on outer proximal border and sometimes additional spines and process, segment 3 curved, elongate and spine-like. Left leg 5 biramous; endopod 1-segmented, or 2-segmented; exopod short, 2-segmented, segment 1 naked, segment 2 very small with a few terminal spines. [B86] Bowman, T. E. 1986. 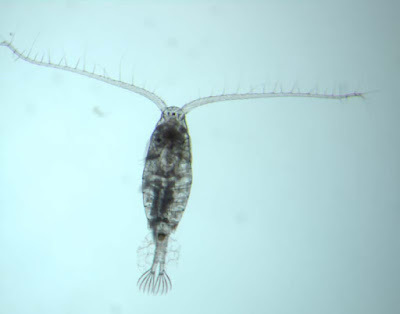 Copepoda: Calanoida. In: Botosaneanu, L. (ed.) Stygofauna Mundi: A Faunistic, Distributional, and Ecological Synthesis of the World Fauna inhabiting Subterranean Waters (including the Marine Interstitial) pp. 295–298. E. J. Brill/Dr W. Backhuys: Leiden. [B68] Brooks, J. L. 1968. The effects of prey size selection by lake planktivores. Systematic Zoology 17 (3): 273–291. [S-MR03] Suárez-Morales, E., & J. W. Reid. 2003. An updated checklist of the continental copepod fauna of the Yucatan Peninsula, Mexico, with notes on its regional associations. Crustaceana 76 (8): 977–991.